The artwork for the Bronson Avenue reconstruction project has been selected. Instead of having a series of smaller artpieces along the sidewalk, like Bank (Centretown), Bank (Glebe), Preston, Somerset, King Edward, and perhaps most (in)famously, Wellington Steet West, Bronson Avenue's art budget was pooled to create two larger installations. There was an open house earlier in November where members of the public could provide feedback to the review panel, and around that time Lana blogged about the locations: on top of the entrance at the Bronson Centre, and along the fence at McNabb. Tim desClouds' wonderful piece, Sit for a While, In the Garden, and Watch the Parade, will run along Bronson Avenue near Gladstone where the Lawn Bowling club is now. It includes a giant layered tree on a fence with cutout figurines. The fence pickets will be bent to create seating inside the fence itself. Tim is the person who did the chairs along Bank Street in the Glebe, and he actually submitted a piece for the other Bronson artpiece location along similar lines. For the other artpiece location, Andrew O'Malley's piece, Community Channel, was selected. It involves a number of aluminium and acrylic figures on top of the Bronson Centre's entrance which, for the first few months at least, will be illuminated in changing colours. I say "for the first few months" because light-based artwork doesn't last long and there is never any money for its maintenance—the sound-based piece at City Hall's Laurier entrance has been broken for a decade and won't be fixed anytime soon. The other submissions—all moot now—were summarized at the time by Eric Darwin on West Side Action and by the Ottawa Citizen. Street trees/urban trees improve the urban fabric and increase property values. The shade they provide in the summer softens the pedestrian experience. This little stand on Preston and Louisa, even without the blooms Eric found, make a pretty solid aesthetic case for landscaping over vanscaping. Half a century on, these trees have grown considerably, giving the park a much different (though not necessarily worse) feel. The canopy provides a low green ceiling to the park, making it a more private and reflective space to appreciate the grass and water features. Street trees have a harder time than those in parks or front yards, due to the smaller area of land for rain to fall into and the increased exposure to salt, but they do sometimes make it. This row is on the north side of Place Bell, 160 Elgin at Gloucester. At the far left you can just make out Grant House (Friday's) and the construction site for the 150 Elgin office tower, mentioned above. The tree canopy has grown higher than the artificial canopy surrounding the building, but there is still much light coming through. On the Nepean Street side of Place Bell looking west toward Metcalfe, the story is a bit different. The condo towers at 18 and 22 Nepean Street block out much of the light that would fall on the North sidewalk, the awning blocks out the sky immediately above, and the tree canopy blocks out the sliver of sky that remains. At eye level, there's little sunlight, and nothing but concrete, bare glass, and tree trunk to look at. 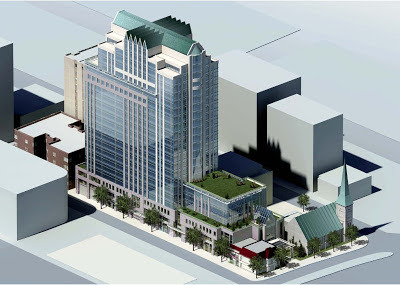 The view on the North side will soon resemble this as 150 Elgin climbs toward the sky. While we can't remove the buildings that are already there, we can make sure that as new towers are built there is sufficient space between them to let light through. The 27-storey tower approved for 91 Nepean and its identical siblings at 70 Gloucester and 96 Nepean, were approved by City Council on lots barely wider than the towers themselves. That sets a nasty trend: if the lots next door are allowed to be built the same way, we'll have a wall of building as dark as the one across from Place Bell, only twice as tall and closer to the street. There are trees shown on the drawings for 96 Nepean, but this is mostly eye candy on the drawings; we (and the future residents of the building) would be lucky if anything green grows at all. It's actually fairly impressive how well these rows of trees surrounding Place Bell have survived in what looks like such small plots of ground*. And that's not a bad thing—removing these trees would certainly make this scene even worse—but the trees were originally added to soften the view at eye level, and now that they have grown beyond that height, something else is needed to fill this role so that this stretch of sidewalk can be more hospitable again. Maybe not a Zen pond, but something. For now, the trees on the opposite side of the street at 150 Elgin will probably have to suffice. Older buildings, especially stone ones, tend to make good subjects for 3D photos because they tend to have more parts sticking out in front of others than more modern buildings. Being mostly grey, stone buildings are also more colour-balanced (important since red or blue objects tend to be bright in one eye and dark in the other due to the filters), though this applies to Brutalist concrete buildings too. 201 Cooper was one of the three stone buildings in this photo. "There were many stone mansions built during the 19th century for wealthy Ottawa businessmen, but by the date 201 Cooper was built (1888-9), stone was becoming quite rare and most mansions were of brick. I noted that there are no heritage designated stone residences in Centretown, and I am not aware of any others that are as large or as close to original condition as 201 Cooper. "The architect of 201 Cooper is not known, but it is similar in general plan, architectural style, and construction details to Italianate mansions designed by Henry Horsey, architect of the Nicholas Street Jail in 1860. He was 57 when 201 Cooper was built." In 2010, the CCCA's Heritage Committee (which is now dormant) expressed concern about the level of heritage protection afforded to this building. As this Centretown News article documents, City heritage staff are adamant that the Heritage Conservation District is sufficient protection. Luckily, it doesn't look like the new Centretown Community Design Plan touches the District, though it does little to reinforce it, either. Given that there are plenty of eligible buildings—with no heritage protection at all—vying for scant City funds for the research necessary for heritage designation, the District will probably suffice for now. So let's just sit back and enjoy this nice stone building—in 3D! This Wednesday, November 21, 2012, the Centretown Citizens Community Association is holding its Annual General Meeting at McNabb Community Centre. In addition to the regular business of the association's members, such as electing directors to the Board, there will be presentations about issues affecting Centretown. 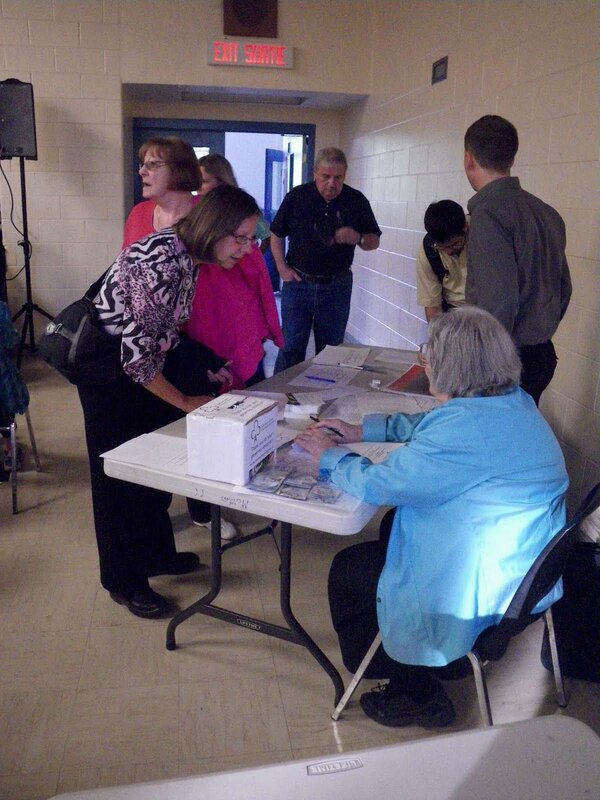 Back in May, the CCCA held a meeting, also at McNabb, to bring attention to the Centretown Community Design Plan. 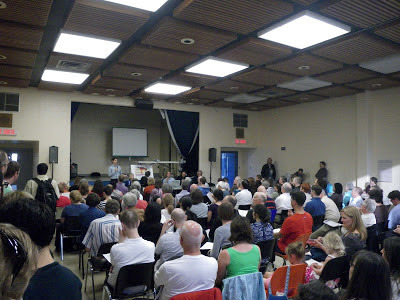 The meeting was very well attended by Centretown residents, many of whom hadn't heard of the CDP before the meeting. The plan was already a year overdue in May and is still. After the City recently released a "final draft" of the plan a few years into the process, the development industry produced a lenghty document with line-by-line edits they want made to the plan. An update will be provided at the AGM on this recent development (pardon the pun) which will yet again postpone the plan going to Planning Committee for approval by City Council. There will also be two presentations at Wednesday's meeting: "Achieving Results for Communities at City Hall," by Christopher Collmorgan, President of our neighbour association, Action Sandy Hill; and "Development — Yes! Lifeless Streetscapes — No!" by Paul Kariouk, Centretown resident and Associate Professor of Architecture at Carleton University. The agenda and reports are available on the CCCA website (permalink), and the flyer contains bios of the two keynote presenters. You can become a CCCA member (so long as you're from the area bounded by Bronson, the 417, the Ottawa River and the 417) at the meeting for only $5 per year, or if you can't make it you can also join and/or donate online. Your participation of time or money is what keeps the CCCA going as a voice for residents at City Hall on decisions affecting Centretown, and will also help us finance what promises to be an expensive OMB appeal of City Council's decision to rezone 96 Nepean Street for a 27 storey tower (I discussed that project and its context in this lengthy post. At the meeting on Wednesday, you can also put your name forward for one of the eight positions (6 for two years, 2 for one year) on the Board of Directors for the election. As it happens, I am chairing the Nominations Committee, whose report is at the end of the longform agenda (a briefer one will be in hard copy at the meeting), so you can contact me (centretown dot ottawa at gmail dot com) if you would like to put your name forward or if you want more information. As you can read in the report, there is a shortage of candidates in the area west of Elgin and north of Somerset, and there are so far only 7 candidates. The Board members elected at the AGM will join those of us in the second year of our terms and from this group will be selected the Executive members: Vice-President, Corporate Secretary, Membership Secretary and Treasurer. PS: Bronson Avenue should partially re-open to traffic tonight or tomorrow, one lane in each direction from Gladstone south. Ongoing work in the intersection at Somerset means a the section from Gladstone to Somerset won't reopen to through traffic for some months yet. Somerset to Laurier will fully close for construction some time next year. Peds on Weds: Bench with a view? The next Walk Ottawa meeting is this coming Monday, November 19, 2012 at 7pm at City Hall in the Honeywell Room. There is much to discuss since a Steering Committee was appointed at the September meeting. If you missed the group's October tour of the City's Traffic Operations Division building, you can relive the experience from a three part blog tour posted after a similar tour of the building in 2009. The bench seems rather deliberately placed in front of that grey box, which doesn't make for very good viewing (nor does the partially-demolished Somerset House). However there is a lock on the box and it looks like there are doors that open. Maybe there is some sort of video screen inside intended as a forgotten piece of public art? The focal point of the image is the statue of Argentinian General José de San Martin. In April, I posted that Mags & Fags cleared a newspaper rack out of their entranceway. Even earlier in the year—in January—there was a water main break on Elgin Street right outside the store, closing it and Vanilla until water could be restored. There's a guy with a shop vac emptying out water that presumably got into his store's basement. By the evening, crews (I presume from the City) had excavated a hole to expose the break in the water main. The vacuum truck on the far side of the backhoe is used to remove soil near gas lines, since a shovel can do lots of damage if it gets too close. You can also see the pipe leading up to the fire hydrant underneath the sidewalk, which, while unrelated, is still something neat you don't see every day. Once the water main had been repaired, the hole was filled up and a cold patch was applied to cover it with rough asphalt. In the spring (June, actually), the road was resurfaced with good smooth asphalt, and the sidewalk was also replaced. An intricate ramp and plank system was used to retain access to the stores while the concrete sidewalk was curing. Some sections of sidewalk along Elgin Street were replaced when the street was resurfaced in 2011, and even more when Bell ran new cables under Elgin in 2010. Actually, Elgin Street's sidewalks have had over a century of turnover. The minimalist magazine racks have been in the window for as long as I can remember. However, while I was walking past it last month, I noticed that they'd changed this up for a different style display. The new shelves are busier than the old metal racks—two of which remain on either end of the display, but it works. It lets the store owners display other materials, to let potential customers walking by know that they don't just sell magazines.